I can't believe that Ricciardo took it from Verstappen. What can Max and Lewis do!!!! Qualifying this season has just been brilliant. My only criticism is that the format doesn't allow us to see full laps of all the front runners. We get a fragmented experience unfortunately, but it's still been fantastic. I hate Verstappen's attitude! Crashing heavily into the 2nd place board. It's still the front row and you were lucky enough to have pretty much the best car today. But your team mate beat you. Put up with it. Ricciardo's had to manage Verstappen beating him enough! And blaming the engine problems for 23 tenths. I respect he's a good driver, but the way he talks in and out the car is just terrible. When is he going to grow up? Last edited by TheGiantHogweed on Sat Oct 27, 2018 7:07 pm, edited 1 time in total. I hate Verstappen's attitude! Crashing heavily into the 2nd place board. It's still the front row and you were lucky enough to have pretty much the best car today. But your team mate beat you. Put up with it. Ricciardo's had to manage Verstappen beating him enough! ...and look who denied Max the pole position this time!! That Ricciardo is pretty good huh? Should be one hell of a run to T1 tomorrow with the way they're lined up! Wow! Didn't see that coming! Amazing lap from Daniel. Looks like this is one record that Max will not break. He had it today but just didn't nail it when it mattered most. I'm looking forward to the start tomorrow. Hamilton and Vettel will be faster at the start and will have a long drag to the first corner. It might be similar to last year at the first corner. Max is stewing and I fear for the race start tomorrow. Cant make it up. I thought Max had this in the bag. I can understand his frustration as he really wanted that record and his first pole. Good job to Ricc. Lewis did well to put it in p3. Here’s hoping for a clean race tomorrow. Sorry Max - although happy to put Brundle's nose out of joint! haha! good stuff! Not sure how that will play out tomorrow for the Red Bulls - chased from behind and fighting for the lead. Vet and Ham together off the line...perhaps the fighting front row will give them the advantage. He'll whack Ricciardo, who will spin backward into Vettel, knocking him to the back of the grid...and it will all be Vettel's fault. After Raikkonen's popular victory last weekend, this would be another popular victory if Dan can pull it off tomorrow. It will be good to finally see the Bulls go wheel to wheel again. It's been too long. There's a cigarette paper betwen Merc and Ferrari here. They could well end up making it easier for Red Bull by getting in there own squabbles. But any one of the top 6 could win this if they play their cards right. I gotta say I'm a little happy Max didn't get the record as that Vettel and TR pole needs to stand for people to remember when minnows could still cut it in F1. Also big congratulations to Danny Ric he played a blinder there allow Max to give it his all, the commentators failed to take in the fact on the two runs he was the fastest of anybody in S3 and didn't push too hard in S1 on the first run. Do you suppose Red Bull is going to have a 'don't challenge into the first corner' agreement? Considering Baku, they must be desperate to keep their drivers from fighting too hard and costing a likely 1-2. I feel like even if they try and implement that it won't be successful. Ricciardo is off so won't to know and Verstappen is Verstappen so won't want to know. I agree with Poker, I can't see all of the top four getting through the first four(?) corners without a collision between some of them. They each want to win the race, it's going to be a case of a rock and a hard place and then you have the clumsiness of Vettel thrown into the mix, Hamilton will try and keep out of trouble but probably get clobbered again like he did last year. I am hoping that Lewis can keep out of trouble. He manages to stay out of wrecks pretty often but sooner or later everyone gets clobbered. It would also be logistically very difficult to implement as a fast starting Hamilton or Vettel could nab the lead if the RBs tiptoe around each other. Just watching the side by side onboard of the lap, Verstappen seems to be able to get Ricciardo in the heavy braking corners, with the exception of turn 5, while Ricciardo bests Verstappen in the medium to high speed corners. Verstappen was over 2/10ths up after turn 3. 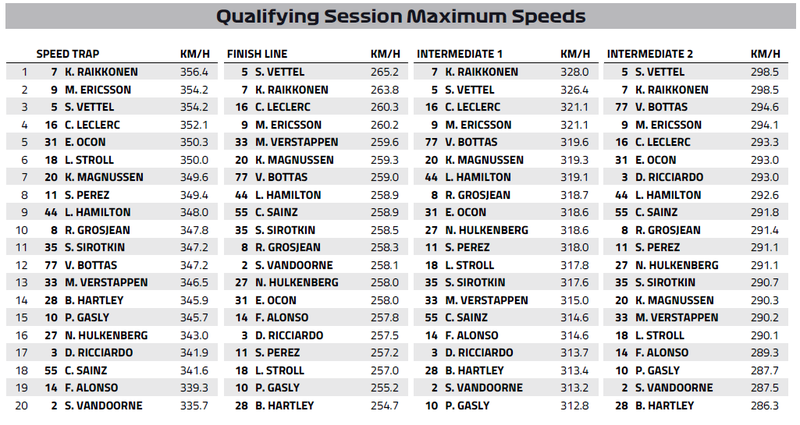 Ricciardo made up that time plus a bit more through the sweeper section. I wonder if that's due to driving style, although they're both great under braking, or car set up, or maybe a bit of both. 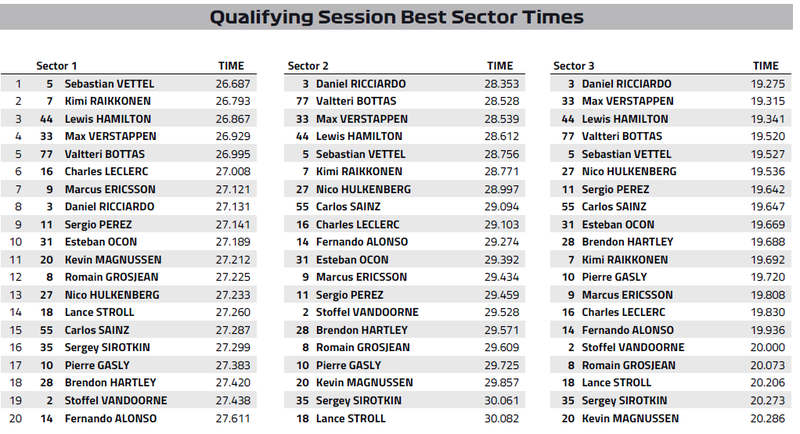 Nice to see that, after the usual Ferrari vs Merc where Ferrari always claws back time in the straights and merc in the high speeds. Showcases how strong Max is under braking, and why Ricciardo is known to have "huge balls" in the high speed corners. Hamilton is neither aggressive nor needs to be when he just needs to finish in the top 7 for the crown. Verstappen is probably bound to be aggressive as he always carries the 'who dares wins' attitude. What I noticed about that is: Max says he lost pole due to a problem with his engine braking, but that's clearly not true. He lost pole because he was weaker through the high speed corners - he didn't lose any time to Ricciardo under braking. Yeah thought the same & wondered if his "enging braking" issue is his version of Vettels " cracked chassis". Considering Max's over inflated ego, he'd never point the finger to himself. Rather point to some small issue which most of us fans could never know the truth or details of. We can just keep scratching our heads thinking "Oh, a software glitch that resulted in poor off-throttle response"! Yesterday in the interview after qualy, he was acting like a sore loser. He's just 21 & has a decade's worth of racing where he will achieve loads of success. He's not in Alonso's shoes where he'll be retiring from F1 & has just 3 races to prove so much. Perhaps without the engine braking issue he would've gained time on Ricciardo under braking? Maybe, but it's still true that he would have had pole if he'd just matched Ricciardo in the middle sector. He can say the engine issue cost him pole, and maybe it did - but he had the ability to take pole with the braking performance he had if he'd just driven a smidgen better in the high speed corners. Blaming it on the car doesn't seem accurate in this case. Unless he has a different setup to Ricciardo. To be fair to Max people are comparing apples to oranges here as they are looking at his 1st run against a track evolution aided Ricciardo 2nd run. It was on Max’s 2nd run that he encountered problems.